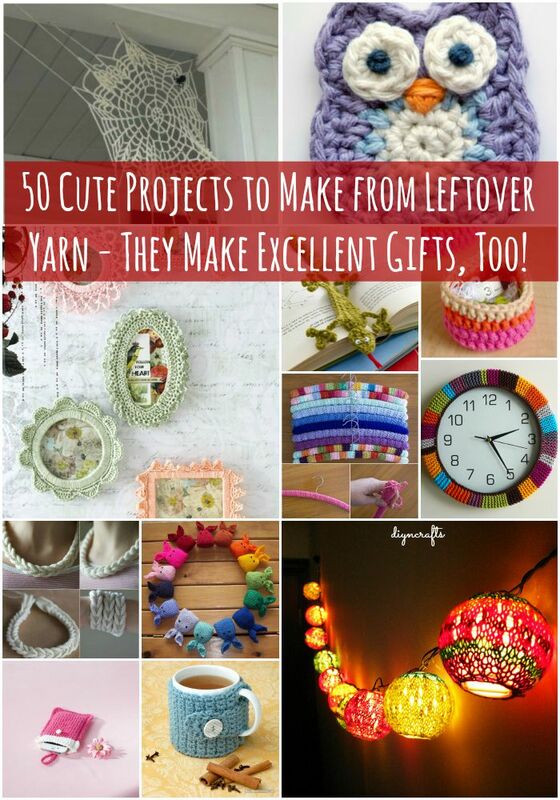 Home » Gifts » 50 Cute Projects to Make from Leftover Yarn – They Make Excellent Gifts, Too! As a crafty person, I feel like there’s nothing worse than wasted material. At the same time, though, it’s never a good idea to let your scraps just keep piling up, or pretty soon your craft room turns into an absolute mess! 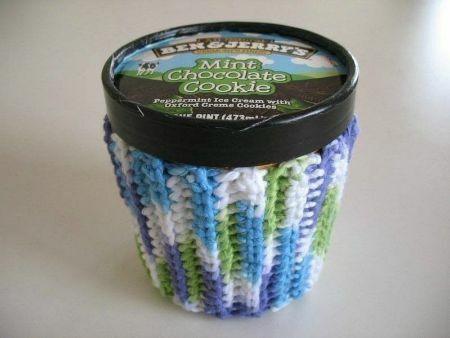 So what do you do with all those little bits of yarn that are leftover after your knitting and crocheting projects? It turns out there are a ton of great ideas for putting these little scraps to use! These projects are easy and fun. Some of them are useful, while others are more whimsical. All of them are giftable. Let’s check it out! 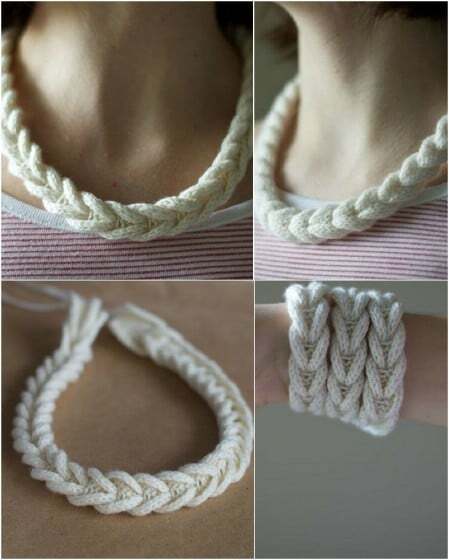 Yarn can actually be a great material for jewelry, especially if you want to make something simple, eye-catching and sophisticated. These cable-braided necklaces and bracelets are pretty, cozy, and comfortable to wear. The technique is quite simple, and this would make a great project even for a beginner. While the white yarn used in the photos is beautiful, imagine how lovely these could also look in color—especially color changing yarn. These necklaces look great at any length, and like the bracelet which is looped several times, the necklaces can also be looped as many times as you want for a different look and feel. I imagine that several lengths around your neck worn as a choker could actually help keep you warm on a cold winter day. And if you need to organize all your adornments, try implementing one of these clever jewelry storage ideas. Do you do a lot of walking or hiking? Tired of carrying your water bottle around in your hand or in your pack? This is a wonderful alternative! 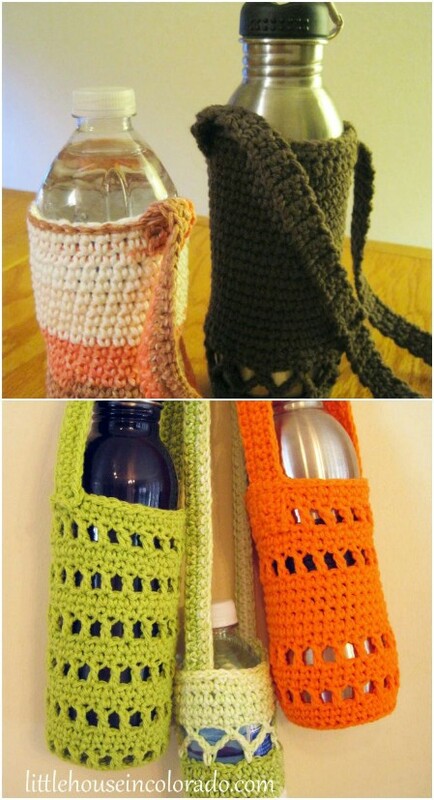 These knitted water bottle holders look amazing, and they include a strap so that you can wear them as you walk. If you check out the tutorial, you will see there are a lot of variations you can make on this pattern for a different look. Very cool! … Because all clocks need something warm to wear? It’s an unusual idea, and it might seem a little random at first, but wow if it doesn’t look amazing! Follow the link to the Retrobaby blog to see the before and after images for this wall clock. The original clock was just a plain metal clock, pretty dull and colorless to look at. With some leftover yarn in fun colors, it has been totally transformed into a pretty snazzy bit of art. This is a very cool design, would be easy even for a beginner, and can add a splash of much-needed brightness and warmth to an otherwise colorless wall. While yarn and light fixtures aren’t two terms you probably readily associate, maybe you should—maybe we all should! These adorable sock yarn lanterns by Abigail Grasso are available as a free pattern over on Ravelry. 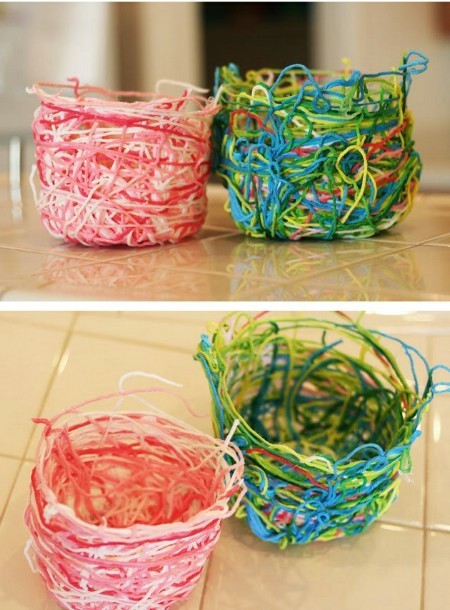 All you need to make them are a string of paper lanterns and whatever yarn scraps you want to use. If you have an odd hodgepodge of colors, that’s great! This is a project that definitely benefits from a lot of different types of yarn. The more colors you have, the more festive the effect will be. You can bet that these would be a big hit at a party. They also make for great ambient lighting every day at home. This is a really cool idea which you could take in any direction you wanted. Here you see pink and white yarn which has been molded into heart shapes and held together by glue. They have a very nice effect hanging from the shelf. Heart shapes are just one idea though. You could literally create any shape you wanted, however complex or simple. If you can imagine it, you can do it. Flatter shapes like these are probably the easiest to hold together with the glue, and simple shapes are easiest to convey, but you could go totally abstract with this project and come up with some really quirky designs. Tassels are just all around awesome. You can use them on anything. 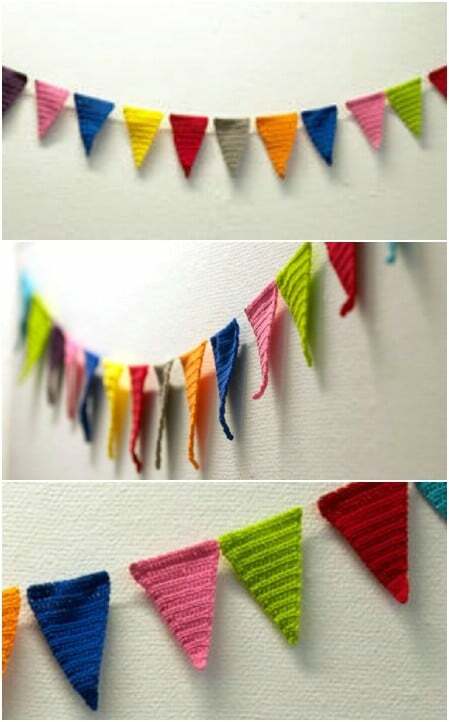 Over at The Sweetest Occasion blog, you can learn how to make them quickly and easily out of your yarn scraps (the pictures show full spools of string cord, but you could easily do this project with leftover yarn). What can you use them for? A better question would be, “What can’t you use them for?” In the blog, it’s suggested that you use them for necklaces or to decorate gift packages. These are both wonderful ideas. You could also use them for so many other things though! Use them to decorate the sleeves of a sweater, tie them around jars you are gifting, add them to keychains and bookmarks, stitch them to the corners of pillows, or use them for party décor. They have practically unlimited uses. They can brighten up any object and add a burst of color and pizzazz. DIY Instructions and Project Credit – thesweetestoccasion. I just love these adorable picture frames! Picture frames make a popular gift item for holidays and anniversaries, but think what a beautiful personal message you could send by gifting one you’ve handmade using leftover yarn. 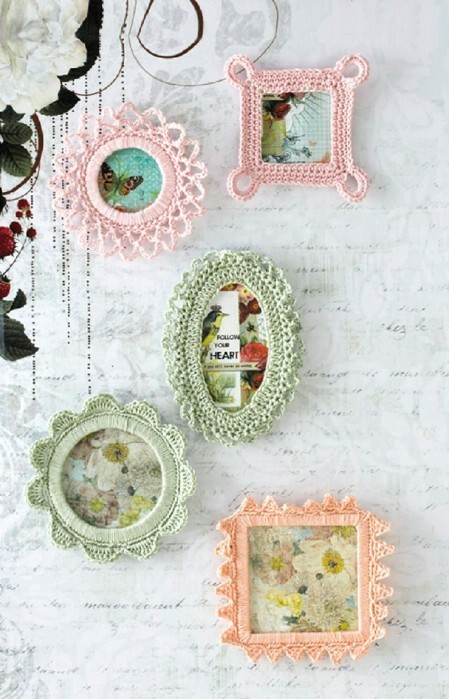 I particularly love the soft pastel colors used in these frames; with the patterns used, they create a beautifully delicate look. You could go with any colors you choose though. Matching the colors in the images you are framing is a wonderful idea. Five different patterns are available here for you to try. Again, they would make excellent gifts, or you can use them to frame pictures on your own walls! These could also make great tree ornaments if you made smaller versions and added hooks. Here is another free pattern from Michaels.com. The tutorial is really brief and this is a simple design that even a beginner could tackle. This is an amazing gift idea for a technology lover; just adjust your pattern to match the right model of smartphone or tablet. 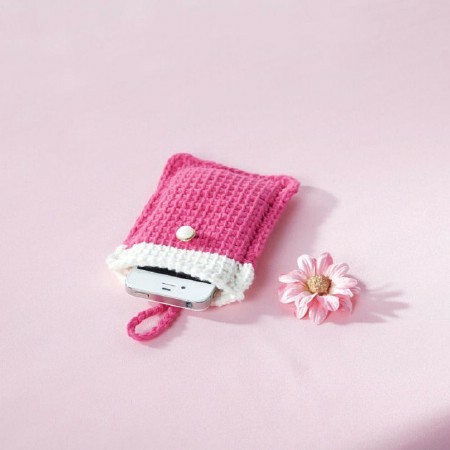 It’s a very cute alternative to a cell phone cover you could buy at the store and will fetch lots of attention and compliments! We have lots of other creative smartphone makeover projects if you’re keen to spice it up a little more. 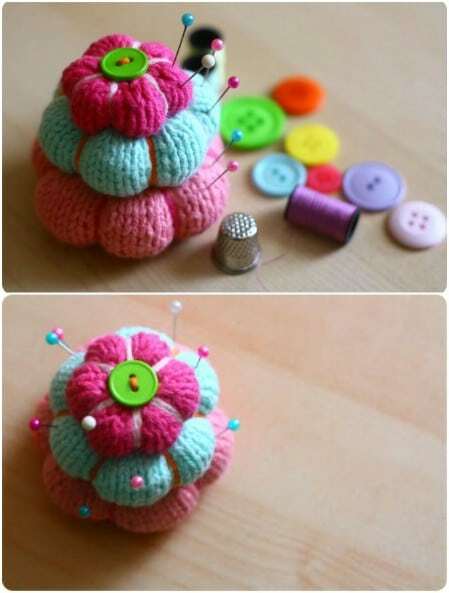 This idea comes from a blog from the Netherlands which is in Dutch, but the author has included instructions in both Dutch and English for these adorable yarn flowers! They are absolutely beautiful, and there are so many ways you could use them. Brighten up the décor in your home, put them on top of gift packages in place of bows, or even glue a hair clip to them and wear them in your hair. It looks like a fast, easy pattern for flowers that will last forever! Love the bookmark idea, but looking for something fancier and maybe cuter too? 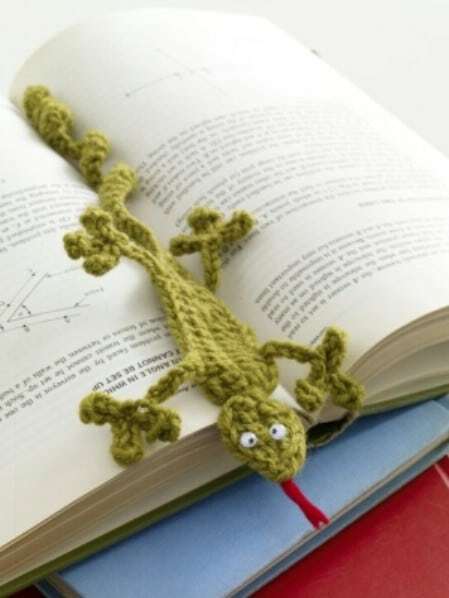 It is hard to get any more adorable than this sweet little gecko bookmark! The knitted gecko has little arms and legs, feet, a curled tongue, and even little eyes and a tongue. The knitted gecko would make a great gift for a child, or a fun project to do with your kids. The gecko bookmark is more than just a bookmark; it’s a cute little reading buddy. Find the free pattern over at Lion Brand Yarns. I could easily fill this whole list with nothing but yarn bookmark ideas! Search and you will find dozens of free patterns similar to our gecko friend. Bookworm bookmarks, beautiful crochet patterns with ribbons, and other exciting yarn bookmark projects await you. Check them out! DIY Instructions and Project Credit – lionbrand. Here’s a great project to work on if you love Halloween! 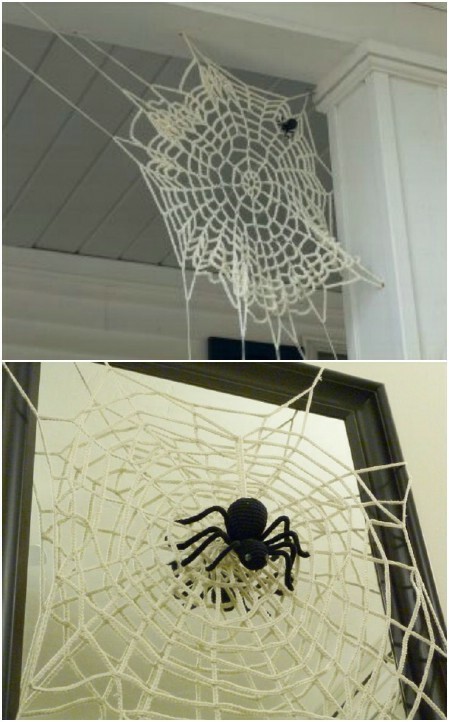 There’s no pattern available for this particular crocheted spider web, but in theory you could use a loose version of any doily pattern that you like. Then you just need to secure it to a corner. This particular spider web is very cool because it doesn’t have a completely regular pattern, which gives it more of a natural look. Still, if you are looking for more guidance, you can check out this YouTube video, which will teach you how to make a more orderly, basic version of the crocheted spider web. This cool idea was found over on WeHeartIt.com and in a few other collections. The original page the idea was on doesn’t appear to exist anymore, but it is way too cool not to be included here. The idea is incredibly simple. 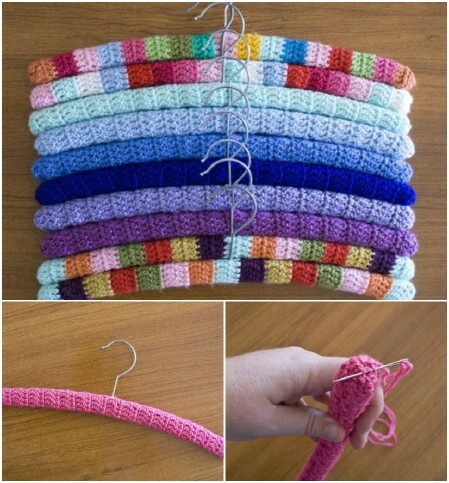 Even a child who has no idea how to knit or crochet could do this project with your leftover yarn! 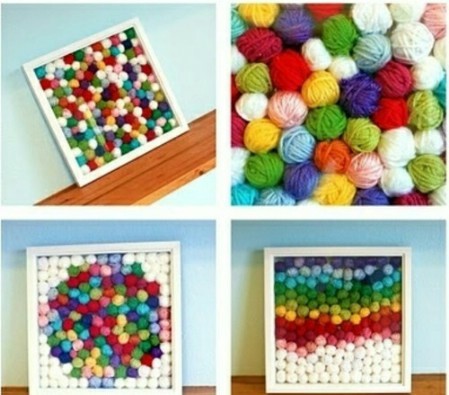 The idea is just to wrap the leftover yarn up into tiny little colorful yarn balls, and then set the yarn balls in a frame in such a way that they form some kind of a pattern. I really like the one in the lower right. What an exciting way to create some modern art! DIY Instructions and Project Credit – weheartit. 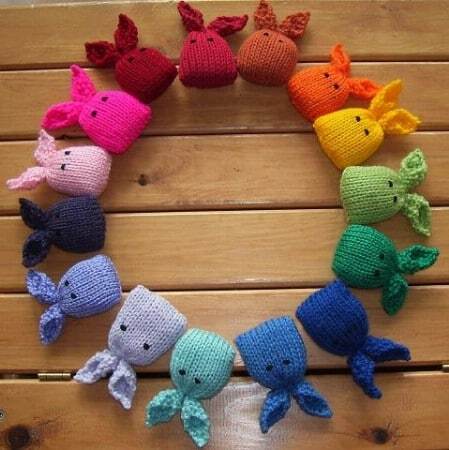 This pattern by Selina Kyle over on Ravelry for catnip bunnies is just adorable! These would make wonderful treats for a kitty cat, but filled with stuffing instead of catnip, they would also make a wonderful little plush toy for a child. Then again, they are just so cute you may want to keep them all for yourself. It is an easy pattern, and the creator recommends it for both children and adults to learn knitting. 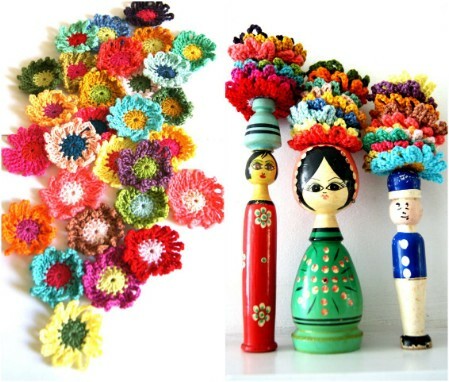 This idea comes from the same Dutch blog where we got the crocheted flowers. Once again, the instructions are available in both Dutch and English. This is a wonderfully colorful pattern which would make awesome tree ornaments, though you could use them anywhere in your house. If you are a member of Amigurumipatterns.net, you have access to tons of great knitting patterns for free. One pattern which would be great for using up your yarn scraps is this adorable hot air balloon project! You can get very colorful with these balloons and come up with lots of cute and eye-catching combinations. Just think how sweet these would look hanging in a child’s bedroom! They could also work as tree ornaments. This pattern isn’t free, but it’s only a couple of dollars, and these little hedgehogs are just so cute I can’t get over it! These would make a wonderful gift for anyone, and would make a fun knitting project to do with your kids. As the creator suggests, they not only make adorable plush toys, but can also work great as pincushions to help you out with your other projects. What knitting and sewing enthusiast wouldn’t want a little hedgehog to keep them company? 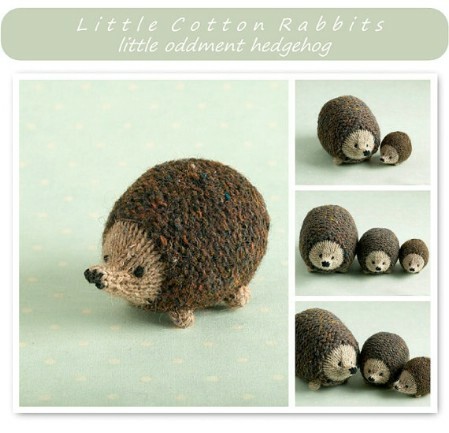 These hedgehogs make great gifts for other crafters as well as a cute addition to your own craft room. Available on – Etsy: Toy knitting pattern for a little hedgehog. Why on earth would your chairs need cozy knit legwarmers? Good question. Okay, so it was just a cute name for a functional item, but these little socks for your chairs really are quite useful. Don’t you hate when your chairs scrape against your hardwood floors? Not only is it noisy, but it cuffs up floor. Over time, it can even cause damage. This is particularly worrisome if you have kids. No matter how many times you tell them to hold back their enthusiasm as they bound away from the dinner table, they are still going to scrape the hardwood when they push back their chairs. 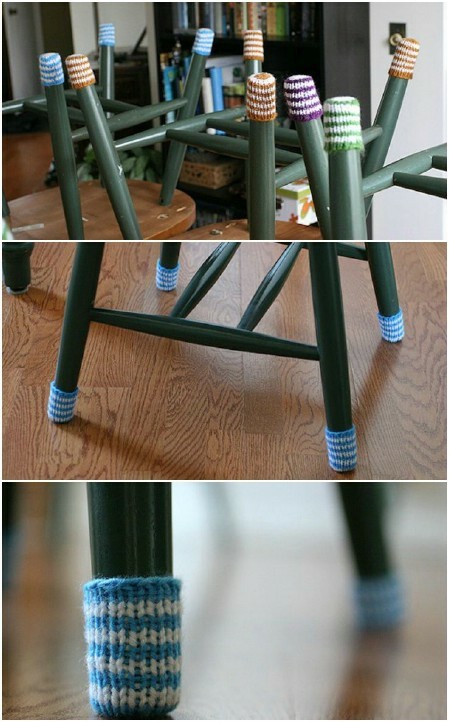 You can prevent further damage to your hardwood floors by knitting these little legwarmers for your chairs. The soft yarn will protect your floors, and also add a little color to your kitchen. What a cool idea! Tired of burning your hands on a hot mug of coffee or tea? 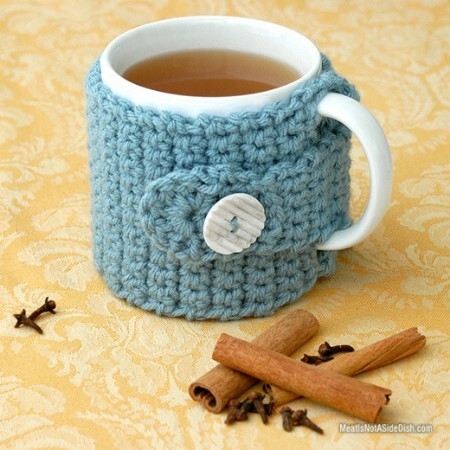 One great solution which will also help you use some of that leftover yarn is a mug cozy! This pattern is available for free, and should be easy enough even for beginners to give it a try. The button makes it easy to get the cozy on and off your mug for easy washing, and also allows the handle to through so you can pick up your mug without the yarn getting in the way. It’s a very clever, simple, elegant solution to handling a hot mug. Add to that the fact that the button is very cute, and you have a winner here! You can view the full tutorial for the crochet mug cozy right here. 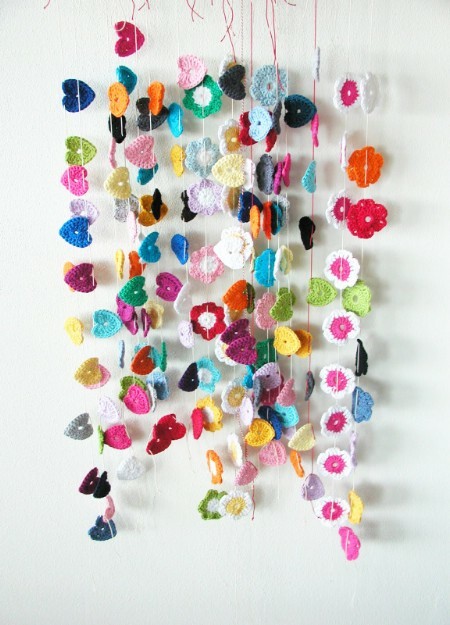 This is a very cute idea for using yarn scraps in a wide variety of colors. This is one of those projects where the more colors you have to use, the better. You will get a really amazing effect. You can hang these flags at parties to spruce up your décor, or you can even just hang them in your home as a permanent fixture. 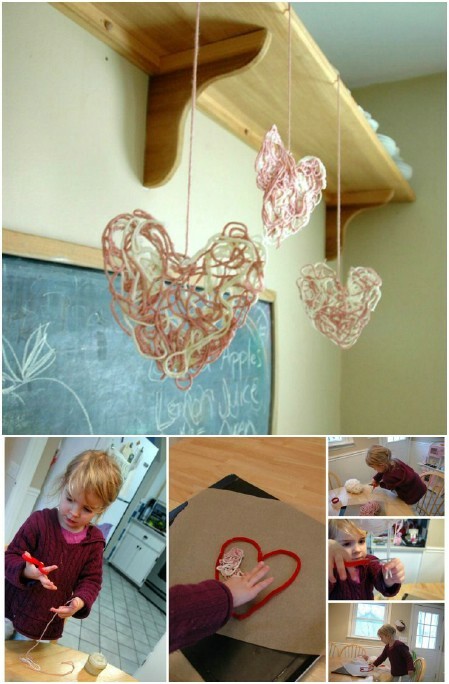 These would look great for example in a child’s bedroom, and also would make a cute decoration for your craft room. There are no English instructions available for making these, but they look to be a very simple, straightforward project. It should be easy to replicate this design even with a basic knowledge of knitting. You could do this with leftover yarn if you don’t like the color (or lack of color), or with a whole spool of white yarn if you wanted to. It’s a really cool idea which is easy to carry out and which has an amazing effect when you’re finished! 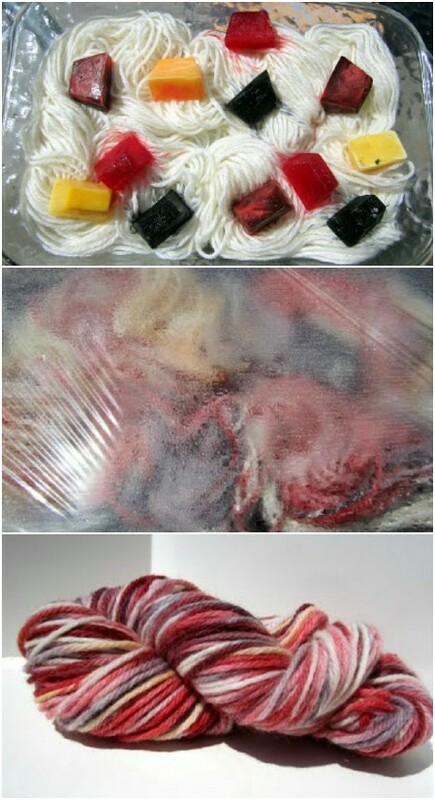 Just freeze some cubes of Kool-Aid in colors of your choice and set them on top of some white yarn in a baking pan. Put the pan outside in the sunlight and wait for the ice cubes to melt, dispersing their colors. Cover it up with saran wrap after about half an hour to aid the dying process. You need to get it pretty hot for the dye to set, so if it isn’t a hot, bright day, you may need to microwave it instead. For full details, check out the tutorial. 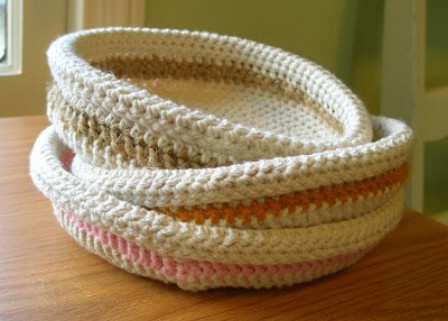 What a great way to take some boring leftover white yarn and make it into something awesome! Just look how cute these little guys are! 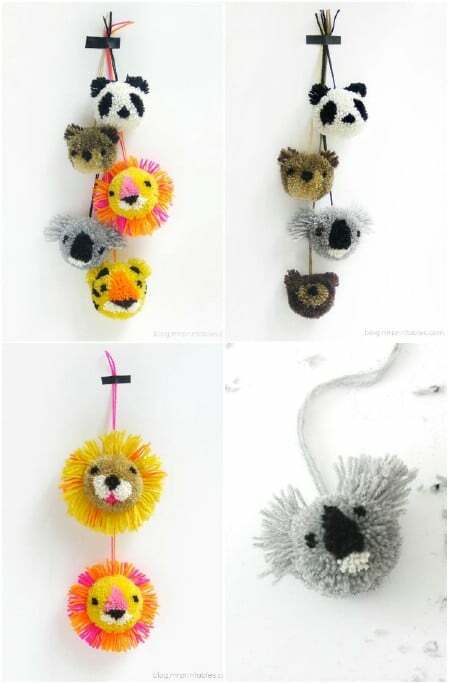 The design is really simple and you only need some basic supplies and a little leftover yarn to make some lovable little animal friends of your own. The tutorial is really thorough, but easy to follow. You will learn how to make a koala and a lion. Once you get the basic process down, you will be able to come up with other animals. You can use the same basic pattern to design anything you can imagine. Just think how cute these would be in a child’s bedroom! They’d also be cute to decorate gifts. This idea comes from artist Aurélie Mathigot. Have some tall sticks you’ve collected outside to decorate your home? Want to add a little something extra to really make them stand out? Crochet coverings for your sticks with fun colors and patterns. This is the kind of really different idea that only an artist could come up with! The effect is surprising and eye-catching, and really looks like a fun, easy project. 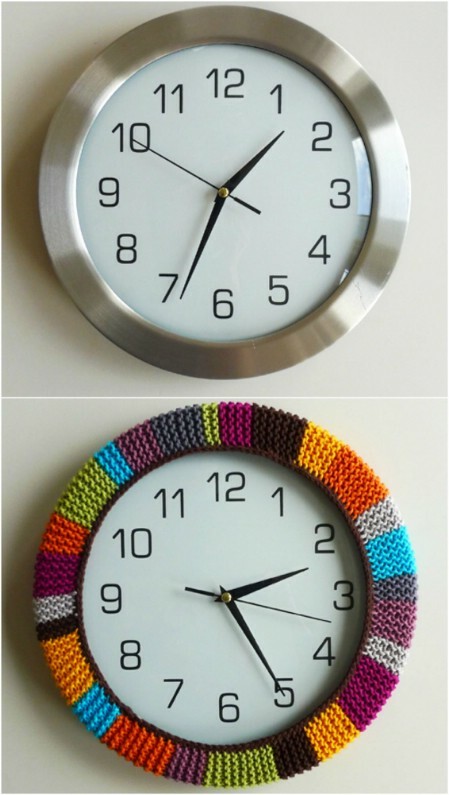 And what a great way to use up your yarn scraps! Love pet rocks, but tired of painting them? 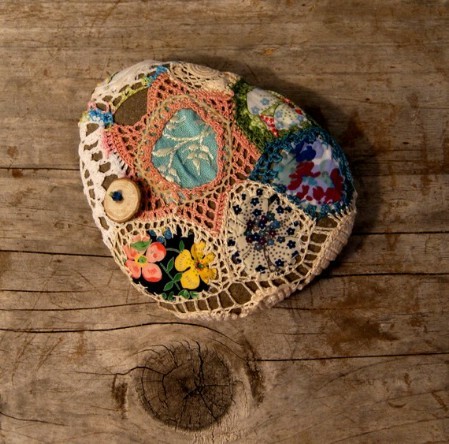 This is a really cool idea for a patchwork river rock. Instead of painting on your rock to decorate it, you can knit a really cool covering for it! This is a fun way to transform an otherwise dull grey rock into an explosion of colorful fun! You could set this rock anywhere and instantly create a fun and beautiful conversation piece. It’d look great on a shelf or a coffee table or anywhere else in the house. I imagine that a bunch of these together would be really beautiful too. You wouldn’t think that a crochet ring could be anything but clunky, but this pattern will teach you how to make a crochet ring of surprising sophistication and elegance. It actually has a very delicate lacey look to it, and would make a great accent for a crochet dress, skirt or top. The full pattern is uploaded for free at the link, so you can follow it to make a beautiful crochet ring of your own. These would make fun gifts too! 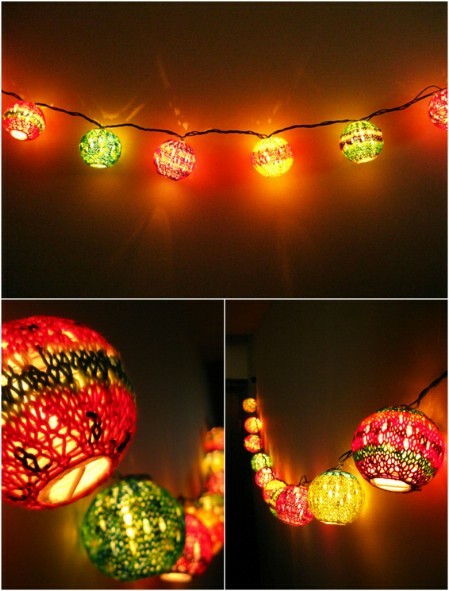 Looking for a really cool décor idea to instantly brighten up any room? I just love this crochet mobile! It is a simple idea and would be really easy to customize. You could even use some of the patterns and ideas I shared earlier to come up with different elements which could hang from your mobile (the flowers or snowflakes from earlier would work great). The more different colors you use, the bolder the effect, so this makes it a perfect idea to use your leftover yarn scraps. This project is scalable; it can be as big or small as you want it to be. Even just a few strands would look really pretty. A larger number of them (like in the photo) would make for a really dramatic effect. These would look gorgeous hanging over a bed or a sofa. If you have a couple rooms with an adjoining doorway without a door, they would make for a fun hanging barrier. Want to give someone a floral gift that will last forever? This is a much more creative and beautiful alternative to silk flowers. The pattern is available free at Michaels.com. Once again, the more colorful the bouquet is, the better the effect, so this will use up your colorful leftovers quickly. It’s an involved project, but it’s once again scalable. Even a small bouquet with just a few flowers would be lovely. A large bouquet could make a wonderful permanent centerpiece for a table. I imagine this would also be an adorable alternative to real flowers at a whimsical, craft-inspired wedding! 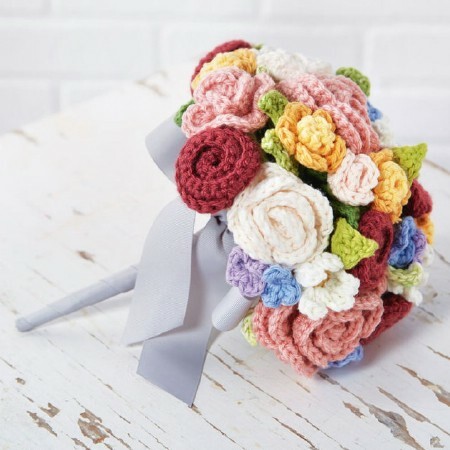 A wedding bouquet that lasts forever—what more could anyone ask for? It’d be a fabulous keepsake for the person who caught it! For this cute little feathered friend, all you need are a few small scraps of yarn in several different colors. 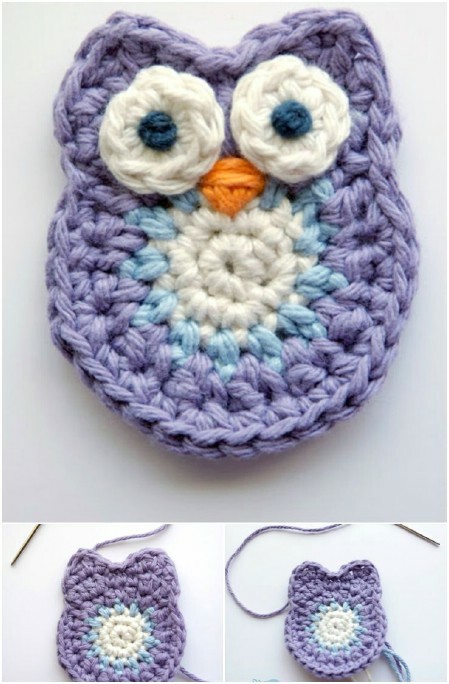 This is a quick and easy pattern that would be perfect for a beginner or even a child to learn crocheting. The owl would make a great gift for any child or adult. It is thin enough it could probably be used as a bookmark. It also would probably work just fine as a coaster. Another idea would be to add a hoop at the top or a hook and hang it on the Christmas tree. Or you could just keep it close and cuddle it. No matter what you do, you’ll have an adorable little knitted friend to keep you company! There is no tutorial on this site, but there are a lot of sweet ideas for making little creatures out of leftover yarn, including some absolutely adorable finger puppets! The little birds in the birdhouses are so cute too! 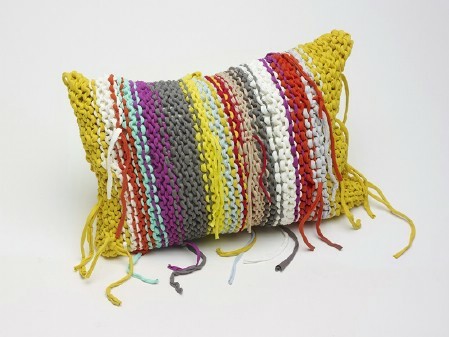 This pillow is a really cool idea for using your leftover yarn! There are no instructions, but it looks like a pretty basic pattern to figure out. I like the “ragged” look of the pillow, because it would make it easier to use really small scraps without it looking like you just ran out of a particular color. You don’t have to worry if you have more of some colors to use up and less of others. Instead, the look seems deliberate. It’s a very clever approach. These pillows would make awesome gifts and they’d add a real pop of color to a sofa or a bed. This is just about the coolest thing I think I’ve seen in ages. Seriously, I am blown away. 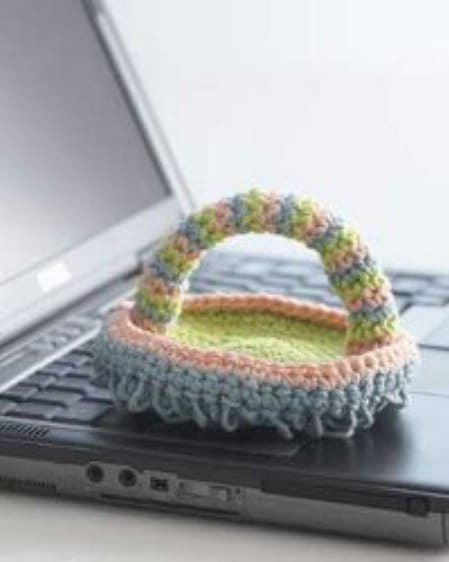 Baskets … made of yarn! I love how they look like they are just holding themselves together and could unravel at any minute. They have a very surreal look to them. What’s amazing is that they are probably solid enough to be genuinely useful for holding a few small, lightweight things. They appear to hold their shapes very well. How do you do it? Eighteen25 has a full tutorial. All you need to do this is a bowl that you are going to use as a sort of “mold,” some plastic wrap, the leftover yarn, and several bottles of standard Elmer’s glue. Basically, you soak the yarn in a dish of glue and water, cover your bowl in plastic wrap so it doesn’t get all mucky, turn it upside-down, and then drape the yarn strands over it. You can do whatever you want as far as colors and patterns; I have seen some yarn bowls that are very orderly and others that are complete chaos (like these). Personally I love the chaotic look, but the orderly look can be very pretty too. And as you can see, even if you use pretty random colors, you get a nice effect, so this is just what you need to use those few loose strands that don’t match any of your other projects. Sea pennies are a common pattern used in crocheting; you can make just about anything with them. They are perfect for making blankets, shawls, scarves, and more. While all the “pennies” in this project are different shades of blue, there is no reason why you can’t use a broader assortment of colors. I have seen some really beautiful sea penny crochet projects which use a random hodgepodge of colors for a very pretty effect. This pattern will teach you the basics, and you can then go from there to make just about anything under the sun. DIY Instructions and Project Credit – ravelry. 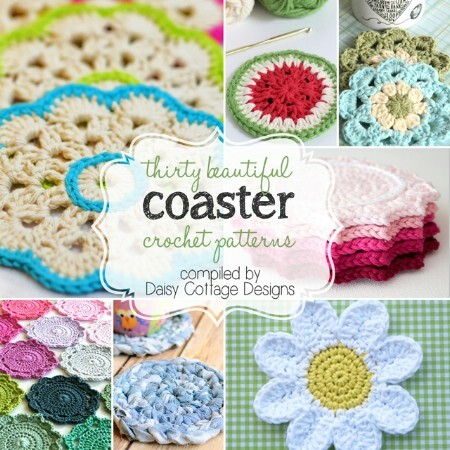 This link has 30 different projects, all for making beautiful crochet drink coasters! Crochet drink coasters are perfect for winter for holding your tea of coffee, and wonderful for your lemonade in the summer. There are so many cute ideas here; those watermelon coasters would be great for the summer months, and those daisy coasters are really clever! 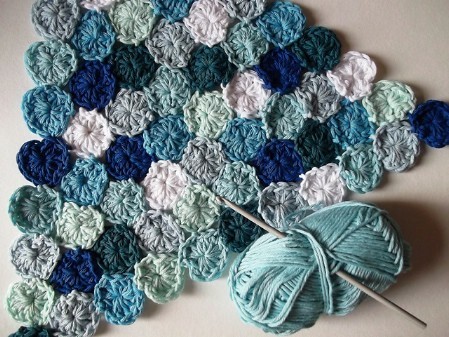 These are fast, easy projects, and any one of them would be approachable for a beginner. DIY Instructions and Project Credit – daisycottagedesigns. If you have some leftover yarn, one great thing you can do with it is make tree ornaments for next Christmas! 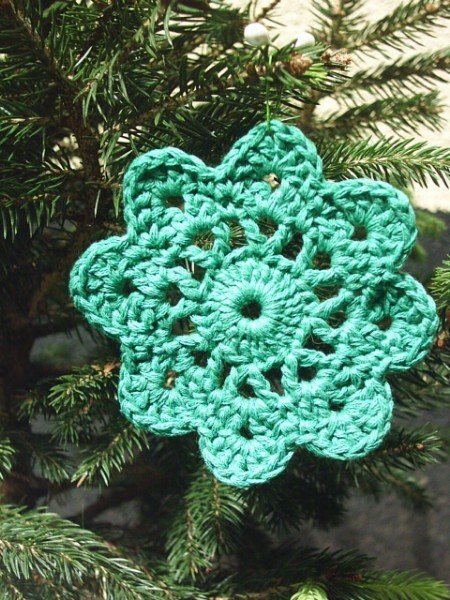 Upcycling blog Look What I Found has a great crochet pattern for beautiful little snowflakes. 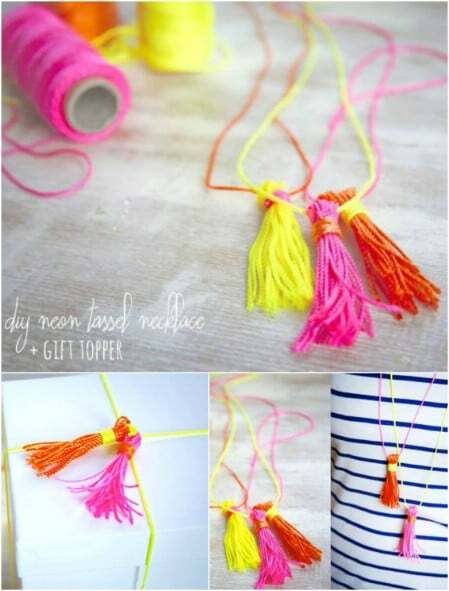 You can make them in any color you want, and they will look fabulous hanging from the Christmas tree. They could also be used as holiday décor throughout the house. They would make awesome gifts if you are trying to think of something simple, easy, and fun which anyone on your list will love. It certainly makes holiday shopping easier, and it will use up all those little yarn scraps you don’t know what to do with! Have some more extra yarn? 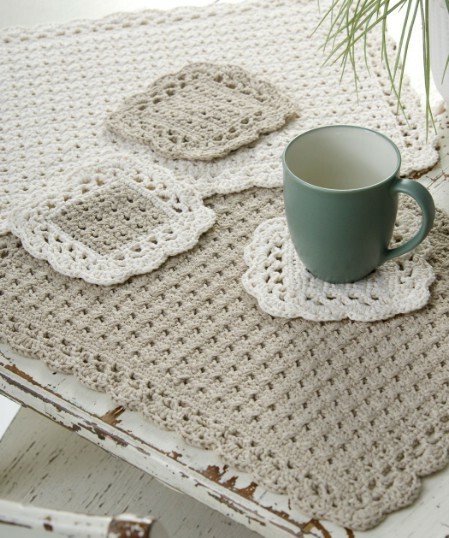 It may not be enough for a hat or a scarf, but it could be all that you need for a crochet placemat! This free pattern by Marilyn Coleman will teach you how to make a really pretty placemat, and as a bonus, you get to learn another coaster pattern while you’re at it. This is another excellent beginner project. While you are in the kitchen, you might notice you could use a few more dishcloths. 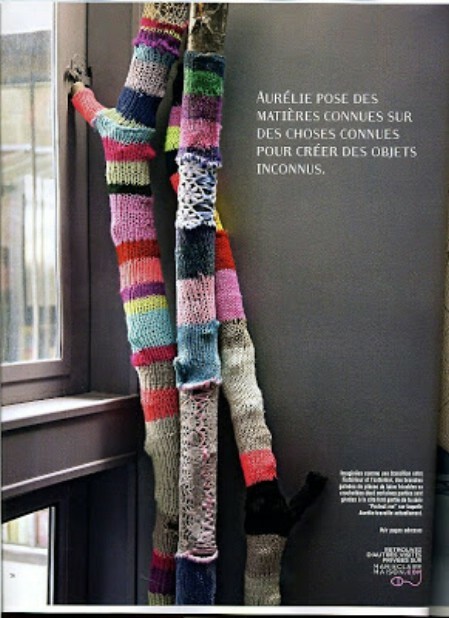 Why not knit them yourself out of your leftover yarn? It doesn’t take a lot of yarn to make a little square, and these are as useful as they are easy to make. The little hoops in the corners are handy if you have a hook to hang your dishcloths off of. You really can’t have too many of these either. If you have plenty for yourself, you can always gift the extras to your friends or family members. They will be glad to have something handy in the kitchen. These are perfect for anything from gift wrapping to hair accessories. Odds are while you are making them, you will think of even more uses for them. Here a row of them makes a great accent to a package. 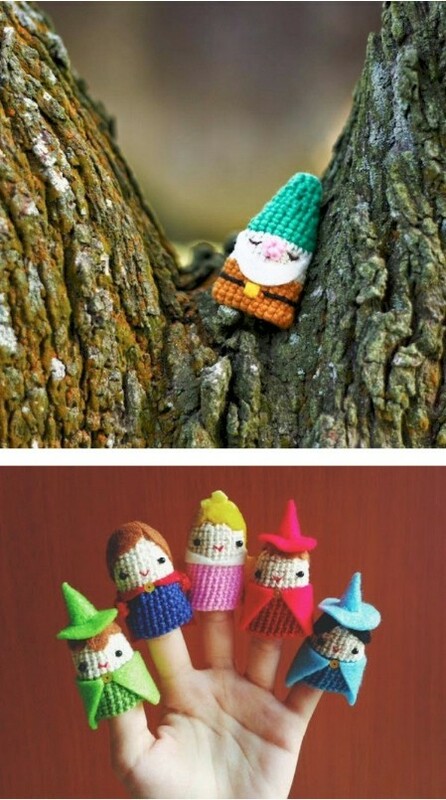 Each one only takes a little bit of yarn, and the overall effect is very eye-catching. 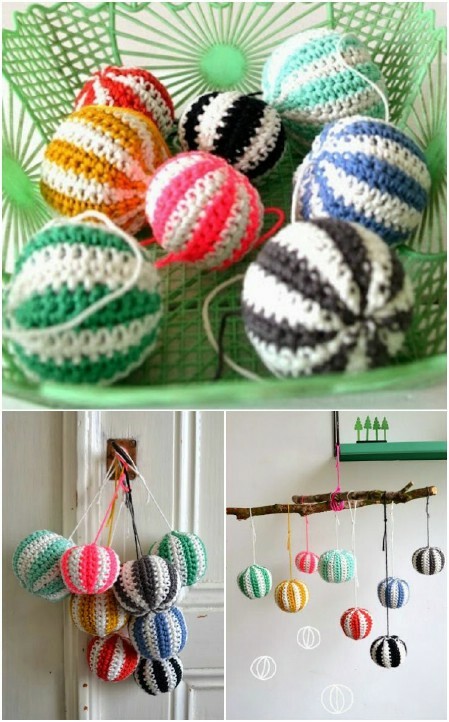 There are a ton of different projects you can do with yarn balls. I’ve seen them for wreaths, mobiles, and much, much more. The thing is, when you are running out of yarn, obviously you might not have enough to make a ball of it. But you may have enough to cover a Styrofoam ball and make it look like a ball of yarn. 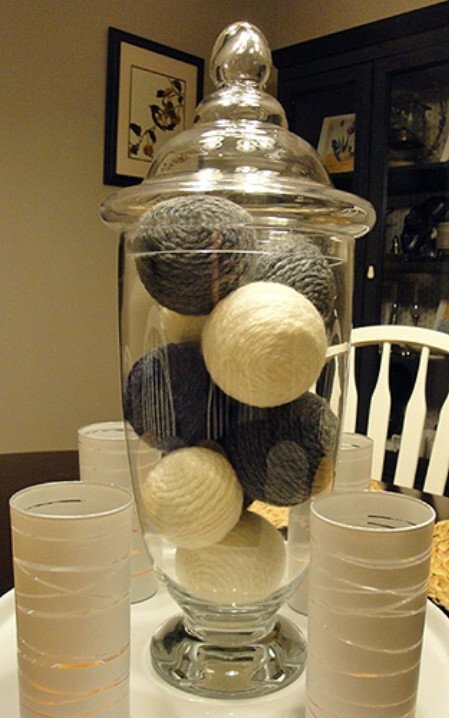 It’s easy and clever and gives you a perfect shortcut for any yarn ball project. Click the link to find out how to do it. 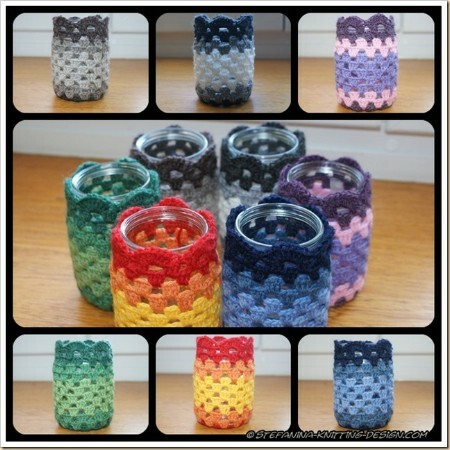 These pretty little nesting cups are a great way to use up extra yarn, and they are useful for storing so many different things, including your crafting supplies! And when they are not in use, you can easily stack them one inside the other and store them. The pattern is completely free over at Lorajean’s Magazine. This super-easy project is a great one for dessert lovers! If you enjoy your frozen treats but hate that moment when your fingers touch the frozen ice cream carton, this project is for you. The instructions are incredibly fast and simple. Also handy for when you have particularly tough ice cream and need to hold onto the carton with one hand while you scoop with the other. 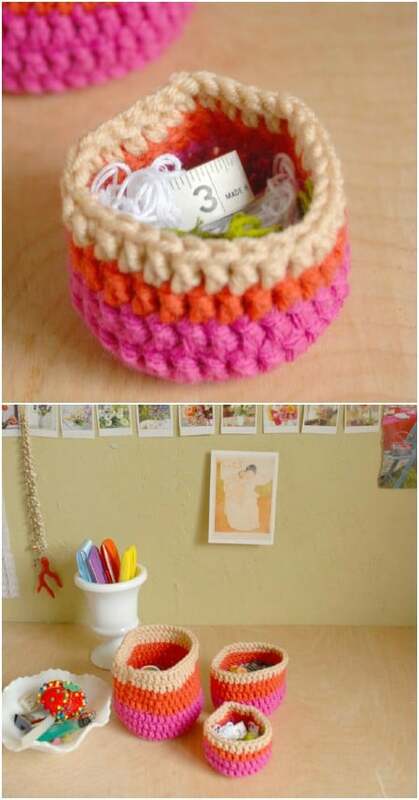 This is a really cute pattern for covering a pencil-holder! You can transform any jar into something colorful and beautiful this way. The step-by-step instructions are easy to follow and there are helpful pictures along the way. And here’s something I could use right about now! This is such a smart and cute idea! This free pattern was submitted to FaveCrafts by Lily Sugar n’ Cream. It’s a wee little duster with a cute little handle which you can use to get all the dust off your keyboard. Seriously, if I had one of these, my keyboard would stay so much cleaner. This pattern comes from Melanie Falick Books, who in turn got it from a print book called Last-Minute Knitted Gifts. 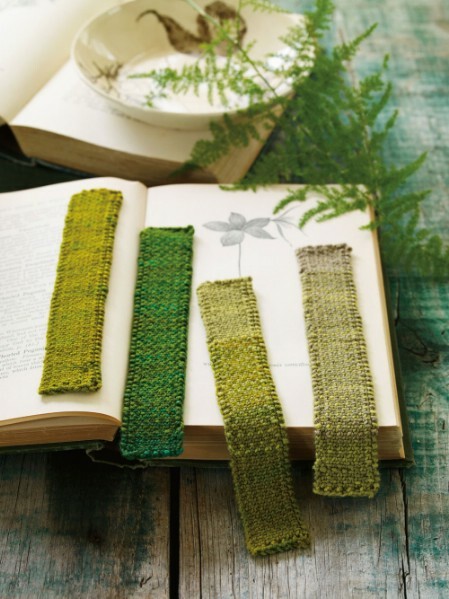 These bookmarks are delightfully simple, and would be a wonderful way to use up little scraps of yarn. I would stick with relatively thin yarn for this project so that the bookmarks will not wear on the binding of the books they are being used in. They really would make great last-minute gifts. It would be especially cute to give them to recipients you are already gifting with books. It’d be a wonderful touch to make the gift more personal. Any bookworm will love these! 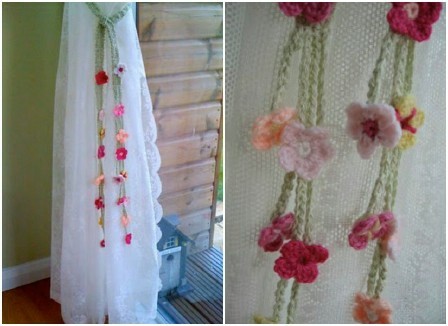 This is a wonderful way to tie back your curtains and add a little pizzazz. Just look how the colors stand out against the white curtains! They’d look great with any curtains, but the effect here is just perfect. I imagine they’d look cute with some little crocheted butterflies as well. Some people just think of the most amazing ideas! These are seriously amazing! 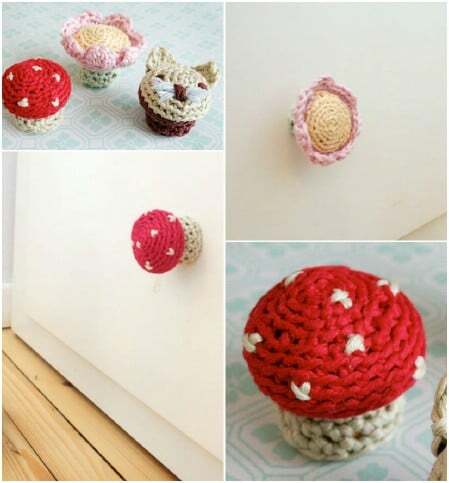 Why have a plain, boring doorknob when you can have a little mushroom or flower or kitten to greet you on your way into a room or a drawer? This would be an easy project to customize, and something children would especially love. Don’t you hate how your clothes are always sliding off your hangers and falling to the floor in the closet? Personally, it drives me crazy, and I always wondered why they don’t make hangers with cloth or something around them to add a little friction. And now I’ve discovered this great tutorial from Karen M. Andersen. Her instructions are presented one easy step at a time, with plenty of colorful photographs to guide you through to completion. I bet these would be addicting to make, and once they are done, they would be very useful. No more clothes falling to the floor! If you liked the idea of yarn baskets from earlier, but you are looking for a more sedate, traditional pattern which actually involves knitting and not just gluing, you may prefer these simple little baskets. The pattern is straightforward, and these baskets are both pretty and functional. Another easy gift idea! 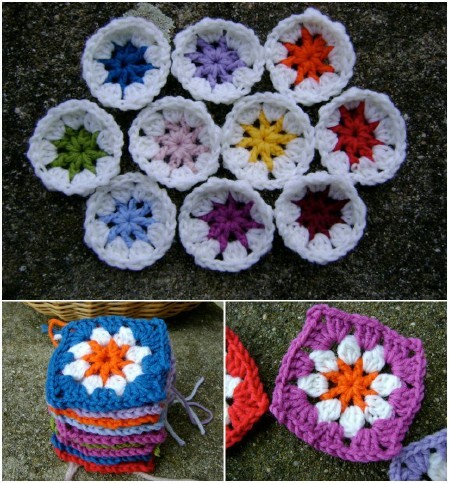 Like the sea pennies I linked previously, these little daisy squares can be used to make anything you can dream of. 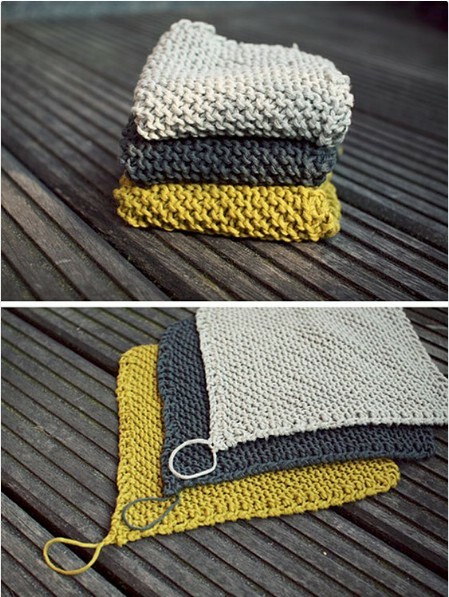 This tutorial will show you how to crochet them step-by-step. What’s great about these is that each one only requires a little bit of yarn in each of the colors you choose. 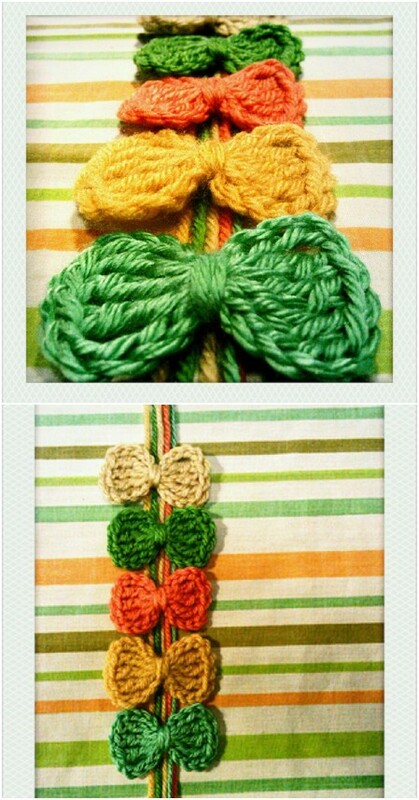 These can combine fabulously with other squares in different colors for a rainbow effect. They make delightful scarves, blankets and more. 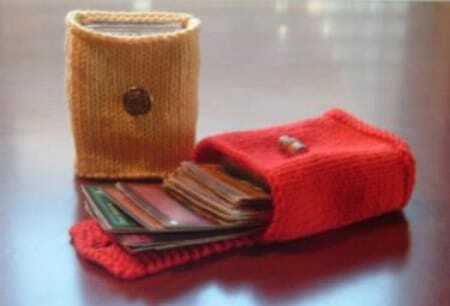 Similar to the idea for the cell phone holder, this knitted card holder can carry two decks of standard playing cards. It is also great for collectible cards and other card games. The pattern is free. This makes a great gift for a geeky friend or for yourself—perfect for bringing your set to a game at a friend’s place! One of the great things about leftover knitting supplies is that you can recycle them into your crafting life by making crafting supplies! Kris Patay’s pattern for the “Posey” pincushion is free on her blog and definitely has a little more zing than your typical pincushion. I love the little button on top. It really brings the whole thing together! This is a perfect pattern for wintertime. Do you love wearing boots, but sometimes feel like your own boots aren’t warm enough? These knitted liners are designed to fit into your boots. You can either wear them as they are, or you can fold them down over top of your boots. They go all the way down, providing your feet with an extra layer of warmth, and include a stirrup at the bottom, which holds them comfortably in place. Why a stirrup instead of a full foot liner? The pattern’s creator says she has discovered that this is often a bit too much warmth, and the stirrup is more comfy. Plus, it probably makes it easier to put your boots on and still have enough room for your feet! 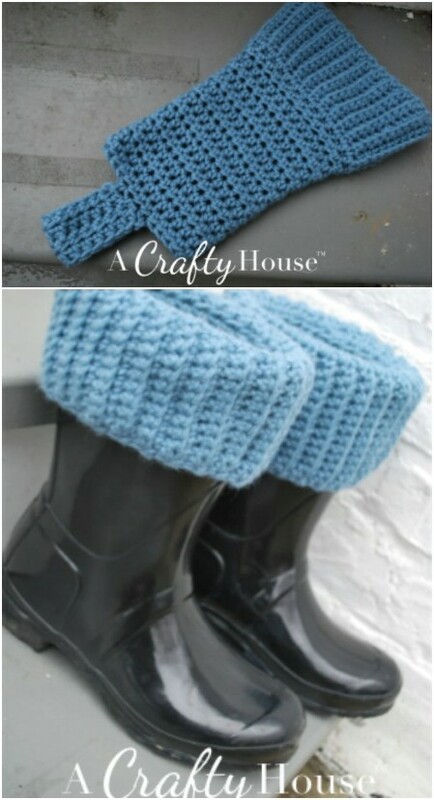 These knitted boot liners are a very cute and clever invention. They’d make awesome holiday gifts! Now you have no excuse to throw away your leftover bits of yarn, but no excuse to let them pile up in your craft room and make a mess either! There are so many things you can do with extra yarn. Whether you’re looking for a big project or a small one, a beginner project or an advanced one, there are dozens of fun ideas here that will keep you busy for hours! Best of all, all of these ideas are amazingly giftable! All great little projects. Thanks for including my ‘snowflakes’. They also make great coasters! Thanks for the kind words Astrid! I had lots of fun collecting these projects. 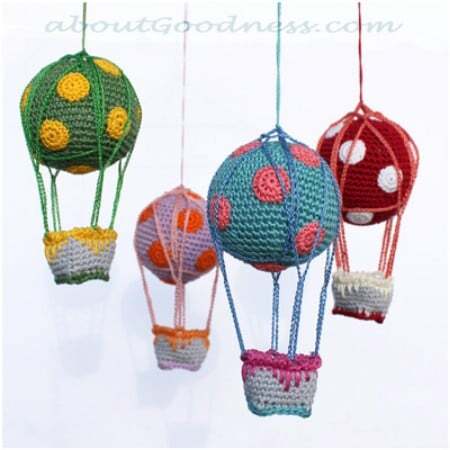 The hot air balloons say above that they are knitted but they are crocheted. I am glad to know that. Thank you for the adorable ideas! I have a jar full of leftover scraps. I’ll have to try these! so many cool things. i love them all! so cool! yeah!